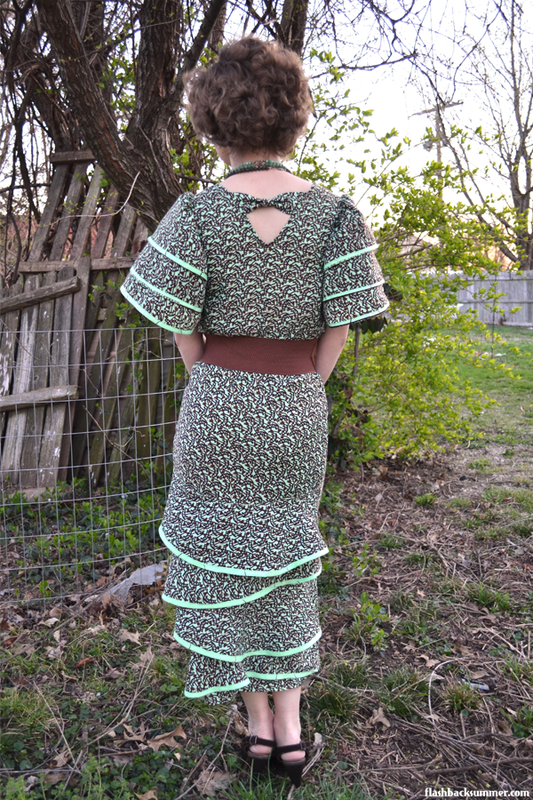 Today I'm debuting a dress I just finished! This is yet another instance of my last-minute "event sewing." My church holds a multiethnic banquet every year for city officials and community leaders of ethnic/racial groups to network and meet each other. Although I had a lot of things to do to prepare for the event, I, of course, got it into my head that a new outfit would do nicely. So... the night before and day of I did a lot of cutting and sewing! I still had to sew myself into the dress for the event, but as for procrastination sewing... that's pretty much a success. I used fabric from Tanzania (specifically, Zanzibar) that my mother gave me from Christmas. From what I can tell, this is a block print. (At least, this is my guess. If anyone is more knowledgeable and can verify or correct me on that, I would welcome it!) I LOVE the bright sea foam color, and the brown pattern is lovely. For this dress, I used Depew E-1830. It's a pattern from 1935. 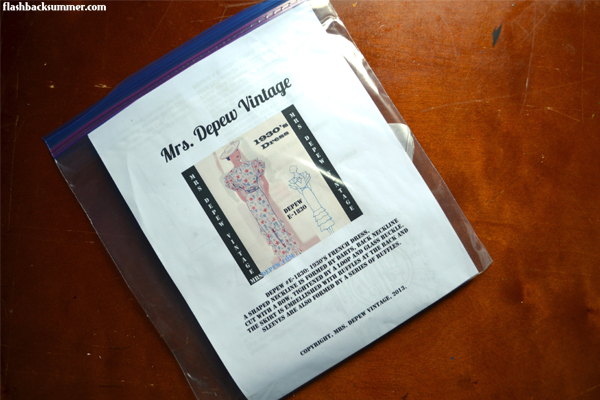 In case you've never used any of these Depew patterns, you should know they are based on a French drafting system that uses rulers to scale up tiny drawings into pattern pieces based on your size. 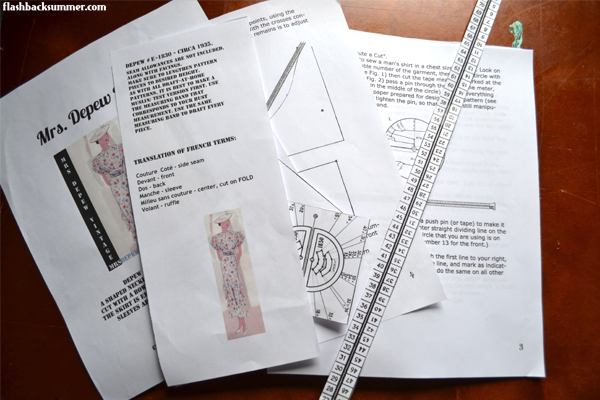 There are usually no instructions included with the pattern and very few markings for things like darts. In this pattern, the only pieces included are for the four ruffles on the back, front and back skirt pieces, front and back bodice pieces, and the three-tier sleeve pieces. The belt and bow pieces are ones you would need to draw yourself. All edges are finished with a hem or bias tape. 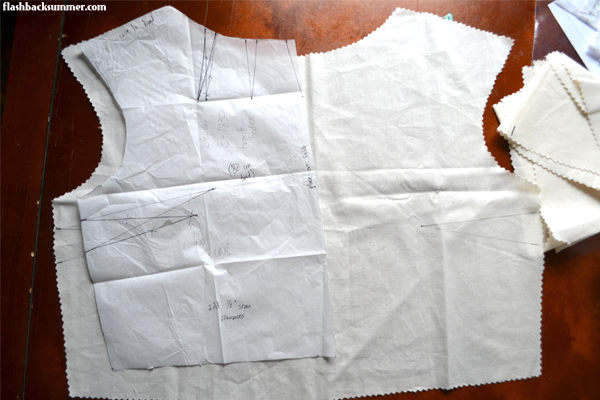 I took the basic front bodice piece and put it on my dress form to figure out proper dart placement. I then transferred these to my paper pattern. With some trial and error, obviously.... 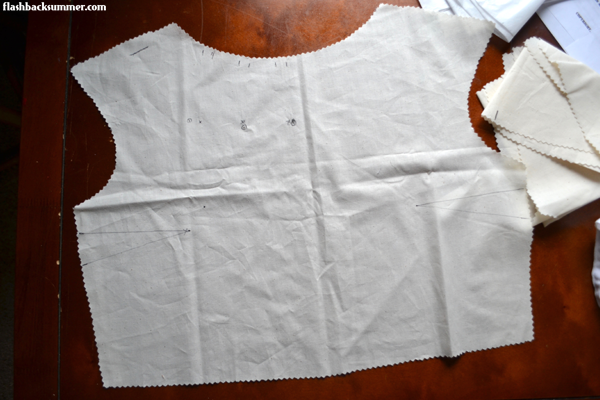 I made a muslin out of the other pieces to check for fit. The skirt patterns were essentially just elongated trapezoids with no curves or darts, so I assumed they should be cut on the bias. 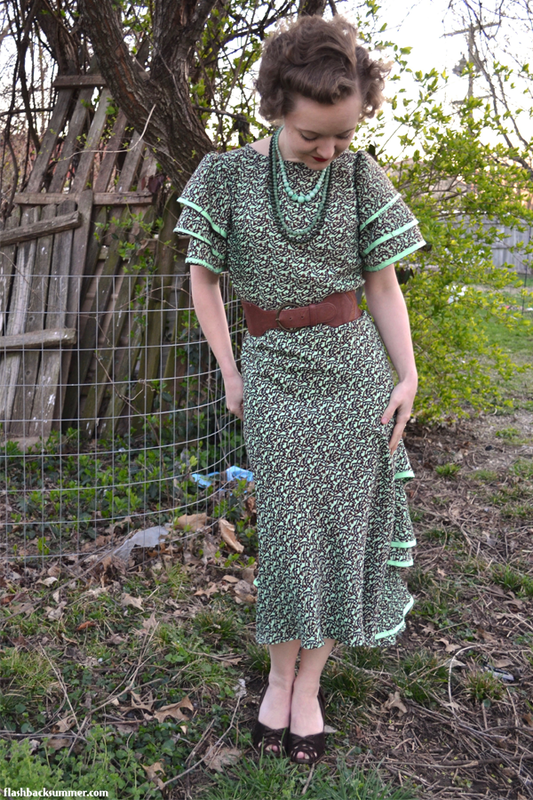 It is a 1935 pattern after all, so I thought it would be appropriate. It seemed to work pretty well! 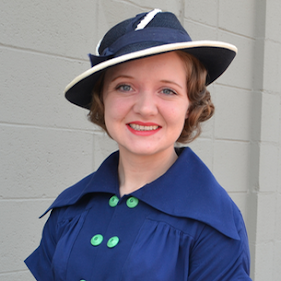 The only major thing I would change for next time would be the bodice length. On my muslin it seemed fine, but the light, airy fabric didn't seem to create enough weight in the skirt to pull the bodice down like I thought it would. However... all of this is covered by a giant belt, woohoo! And how about these ginormous sleeves?! At first I was a bit concerned about their volume, but now I think works. Plus, the bigger the sleeves are, the smaller one's waist looks. There is also an element of major make do and mend to this dress. I wanted to only use items from my stash and to avoid buying anything, but I was left with a dilemma. 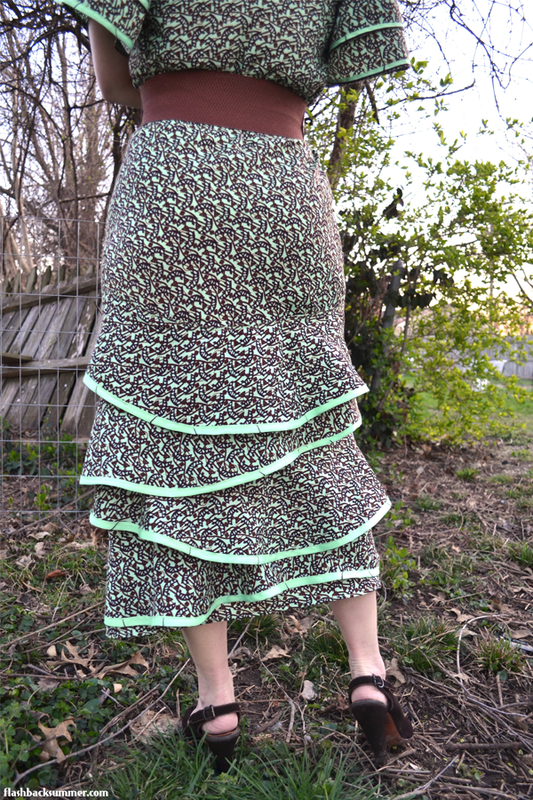 The pattern on this fabric is quite busy, and I was afraid that the ruffle and sleeve details would be utterly lost if they weren't highlighted in some way. However, I didn't have bias tape in an even remotely acceptable color, and I was sure the store would only have brown, which didn't seem like it would pop enough. To stay within my stash, I decided to use... the fabric selvedge! I noticed that the pattern ended about 3/4" from the edge of the fabric, so I was careful not to cut any of it when I cut the pieces out. 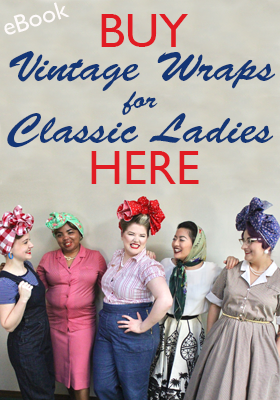 I then had several yards of narrow tape I could use that was the perfect color! You can see the printed phrase "100% Guaranteed Veritable Print R.B. No. 6699" on some of the sleeves, which I don't mind. It's just some sewing character! 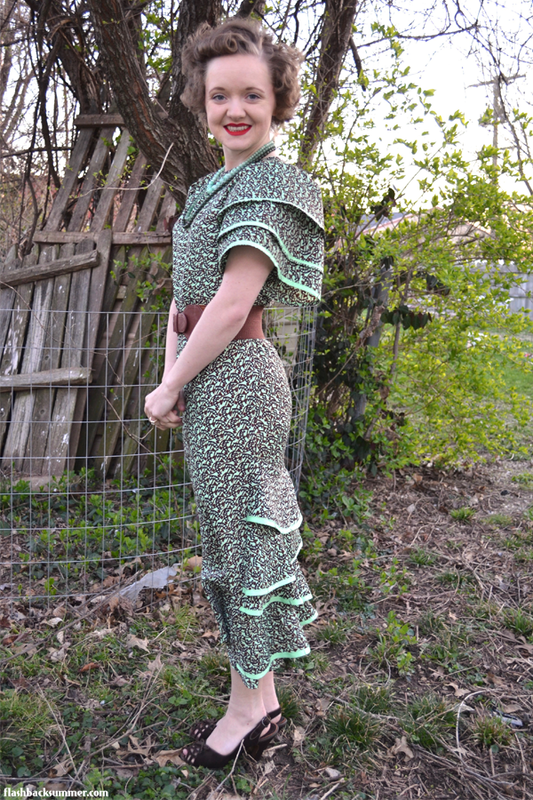 The only other issue I encountered was the ruffles on the back. I'm not entirely sure whether it was a poor drafting on my part or just pattern pieces not working together well with the bias cut of the skirt. I was having trouble lining them up and making them parallel across the back of the skirt like the pattern illustration showed. They weren't long enough to go across the back, and then the edges were not falling evenly. So, short on time and not about the recut all these pieces, I decided to go for an asymmetrical layout and call it a design feature! I rather like the effect, actually. Have any of you tried a Depew pattern or a drafting system like this? On another note... What do you think of these sleeves?! Are they too much, or do you think they work? This dress is such a feast for the eyes! What a vibrant, beautiful creation (that looks terrific on you). Looove the sleeves. 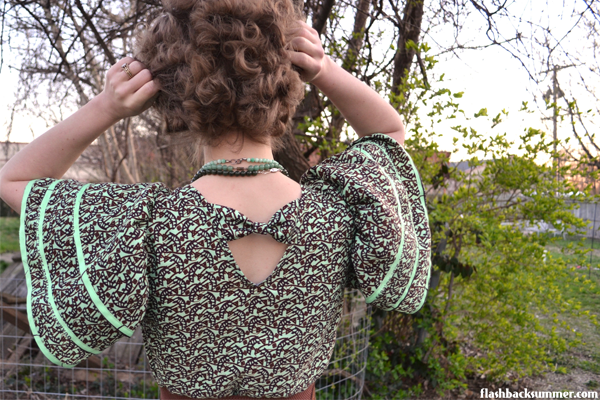 But I have a weak spot for big or puffy sleeves. They are definitely not too much! I have some experience with the Lutterloh system. But had to alter the patterns a lot so mainly I use them as a guide and draft my own patterns. I love the sleeves and I think I like the asymmetric Ruffles on the skirt even better than I would have liked them straight. I love the back view!It gives a sort of Flamenco vibe. Brilliant use of the selvage to make trim, congratulations. The sleeves look a little large from the side, but spot on from the back and front, but that may also be because they seem a bit stiff. I've used a Pickens square to draft up some clothes and love it. I own a couple of Lutterloh patterns, but haven't bothered to make them up. Emileigh, that dress is STUNNING!! I never would of guessed you basically made it in 24hrs!! I love the color, and how you utelized the selvedge, that's amazing. That is, I think, the most GORGEOUS dress that you have ever made! Omg I love it! I hope it was much loved at your event! I LOVE your dress Emileigh! It suits you so perfectly. The color and print are gorgeous, and I love your clever use of the selvedge for finishing the edges. As for the sleeves... perfection! 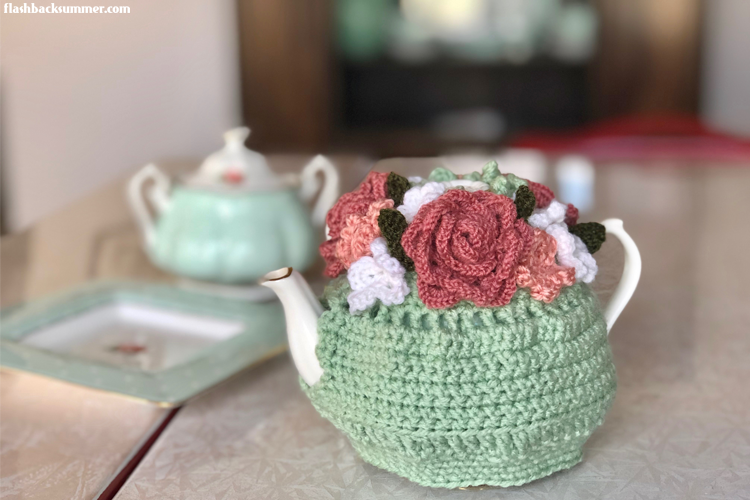 I've used one Mrs Depew pattern so far and, although it looked rather simple, it turned out quite complicated and the sizing seemed completely off. It hasn't dampened my spirits though, I will definitely try another one at some point. Your dress looks amazing and those sleeves really are something. I actually love the asymmetric look of the ruffles at the back and thought they were meant to look like that! This is a beautiful dress, it looks fabulous on you. I love the colours and all the ruffles!